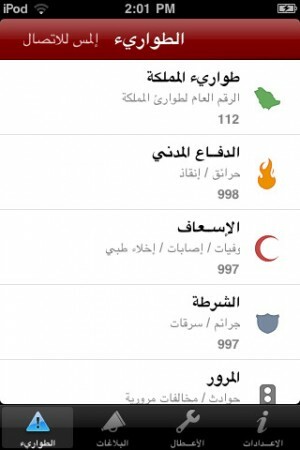 Tawari is a new iPhone app that’s a dialer for emergency services in the Kingdom of Saudi Arabia. Tawari app is very easy to use, just select the service you want to dial and the App will initial the call. This pushes the need for a unified emergency number, why should people worry about what number to dial? 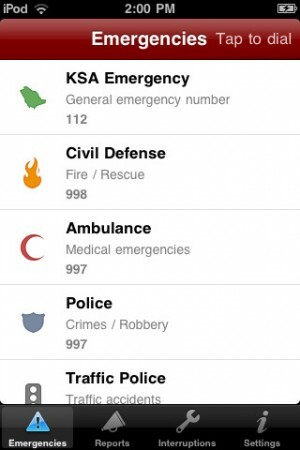 The numbers include: KSA Emergency 211, Civil Defense 998, Ambulance and Police have 997?! The numbers also include electric company, telecommunication services and more. You can easily change interfaces between Arabic and English (requires restarting the app, no need to change the iOS device interface). Tawari also offers the ability to copy all these number to the phone book (but not a selection, we hope to see it added in a future update). Tawari is developed by Samy Alzhrani, designed by Bandar Raffah and from the Vector Group from Jeddah). 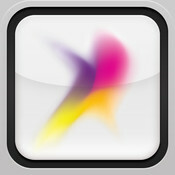 Tawari is a free app. This is not the first of it’s kind for Saudi emergency services. Saudi SOS is another one but it’s extremely limited as it have only 6 emergency numbers.